Leviton Decora® IllumaTech® Electromechanical 3-Way slide dimmer in white face color, allows to control the brightness of the light. It has voltage rating of 120-Volt AC at 60-Hz. This 1-Pole wall mountable dimmer has incandescent load capacity of 600-Watts and LED and CFL load capacity of 150-Watts. It measures 4.15-Inch x 2.12-Inch x 0.38-Inch. This dimmer is ideal for dimmable LED and CFL lamps as well as incandescent. It incorporates built-in starting technology for CFL lamps. 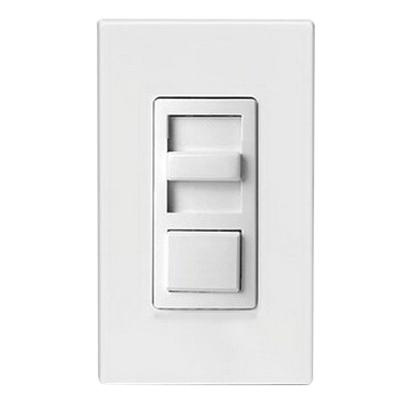 This dimmer offers wider dimming range on LED and CFL lamps. Optional programming feature in the dimmer allows users to modify the dimming range to the required light level. It is compatible with Decora® Plus™ screwless and Decora® standard designer wallplates. Dimmer is UL listed and CSA certified.